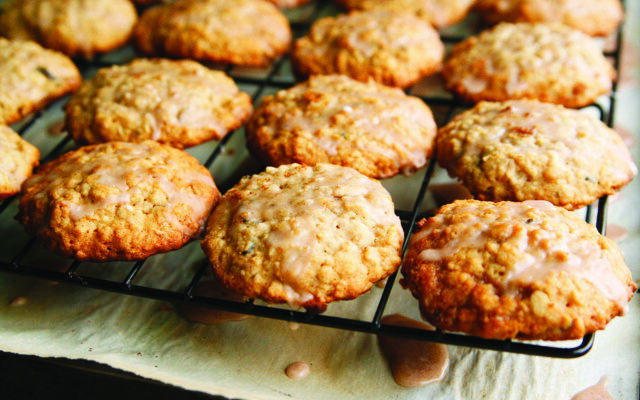 Have some fun with your apples this fall with this recipe for moist, flavorful Iced Apple Oatmeal Cookies. And perhaps that’s because the venerable apple has a good amount of dietary fiber (one medium apple yields about 17 percent of the daily recommended amount you should eat, according to World’s Healthiest Foods) as well as some vitamin C. Good for a snack, they are also great in recipes from sweet treats to savory side dishes. And applesauce is always a great use for apples — perfect enjoyed alone, with pork chops and more. There really are so many great ways to enjoy the apples that are ripe in Maine beginning in August and continuing through October. And there are so many varieties to choose, from the multipurpose Cortlands to crisp and juicy Honeycrisps. Find them at pick your own orchards throughout the state, or buy them from your favorite apple growers at local farmers markets. Have some fun with your apples this fall with this recipe for moist, flavorful Iced Apple Oatmeal Cookies. They are perfect for sharing with a fall-loving crowd. In the bowl of a stand mixer fitted with the paddle attachment, add the butter and sugars and cream together until smooth. Add the apples and mix well to combine. In a large bowl, sift together the flour, oats, baking soda and salt. With the stand mixer running on its lowest speed, add the flour mixture a little at a time until fully incorporated. Add the hot water to the stand mixer and mix on low until smooth. Use a medium cookie scoop, or two tablespoons, to drop the cookie dough in mounds on a parchment-lined baking sheet. Bake for 8-10 minutes until golden. Transfer cookies to a cooking rack and let cool completely. To make the glaze: Stir together the glaze ingredients. Drizzle on completely cooled cookies and let sit for at least 30 minutes to set. For easy cleanup, set the cooling rack on top of a parchment lined baking sheet before glazing.